Apple's teaming up with Volkswagen to make autonomous driving capabilities a reality for the latter's T6 Transporter van. Apple Inc. (AAPL - Get Report) is hooking up with Volkswagen ADR (VLKAY to build self-driving cars. It could be a match made in heaven, right? I mean, a tech giant worth almost $1 trillion and with enough cash to buy seemingly whatever it wants teaming up with one of the world's largest automakers. We'll be riding in an Apple-powered autonomous Porsche, Audi or Volkswagen before we know it! Well, unless you work for Apple at its headquarters, that won't be the case. And even if you do, you'll be riding in a Volkswagen T6 Transporter van and it might not be until 2019. 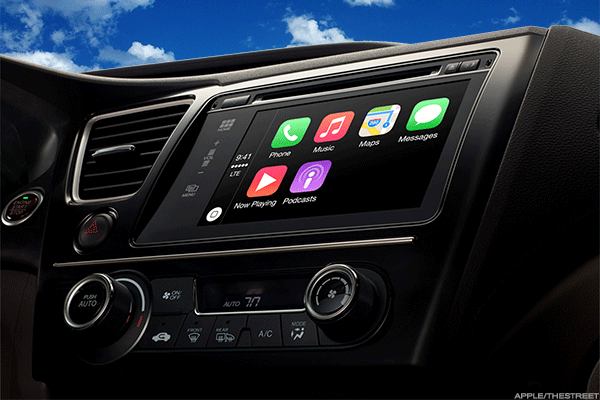 Apple once had big ambitions when it came to the car. It was going to build all-electric, autonomous cars -- not unlike what Tesla Inc. (TSLA - Get Report) is working toward -- and change the world forever, just like it did with its iPhone. But then it found out that building a car from scratch was pretty tough and very expensive. That seems like an odd revelation for a bunch of brainiacs working at Apple, as it's pretty common sense that it's a huge undertaking. In any regard, Apple then explored the idea of manufacturing contractors building its cars and ultimately turned to partnerships with automakers. Management first tried to hammer out a deal with BMW and later Mercedes. Neither panned out because Apple wanted too much control over the data, design and user experience. Admittedly, Apple's done really, really well in all three of those categories with its own products. But from BMW or Mercedes perspective, why would they think Apple could swoop in and do better than them? Ultimately a deal with Volkswagen was quietly put together in late-2017. Apple is now working with Volkswagen to essentially retrofit some of its T6 passenger vans to use as autonomous shuttles for its employees at its headquarters. That's according to a New York Times piece detailing the partnership. The project is demanding nearly all of the attention from Apple's autonomous vehicle team. Plus, it was supposed to be completed by the end of this year and that no longer seems realistic. Things like the frame, wheels and chassis will remain the same as Volkswagen's design, Apple is replacing things like the dashboard and seats, while adding its own computers, sensors and other equipment. It's left the team flustered and with little surprised, there's been a lot of turnover in the company's self-driving unit over the past few years. Right now, it's unclear whether the partnership will expand beyond its current scope, but given the size of both companies it's certainly possible. Worth noting is that Intel Corporation (INTC - Get Report) recently inked a pretty big deal with a European automaker for its EyeQ5 chips to be used in 8 million vehicles starting in 2021. We don't know who the automaker is, but we do know that Volkswagen has been workingwith both Intel and Nvidia Corporation (NVDA - Get Report) on autonomous driving solutions. So again, it's not clear whether Apple and Volkswagen will push the autonomous driving envelope much further, but if Apple's going to, it might want to pick up the pace or risk falling completely out of the race.